This is a recipe loosely based on a Mexican pozole, but with less work. Its far from traditional (it uses green AND red ingredients, oh my), but it fills me up and it’s deliciously healthy and full of ingredients that make you feel good about yourself.Remember how I told you to save everything for stock from the past couple recipes? Now’s your chance to use it- throw the chicken bones, gizzards, and any and all veggie trim into a pot with enough water to cover it, then add about 1-2 teaspoons salt. Bring it to a boil, then let it simmer for at least 1-2 hours. Strain, and presto, you just made stock using what you normally trash. If you don’t have the time or desire, just buy your chicken broth. In a large stock pot, heat olive oil on medium-low. Add the leeks and sauté, stirring occasionally, until soft, about 5 minutes. Add the garlic and stir for another minute or so. Add the chipotle, tomatillos, oregano, and cilantro. Cook briefly until tomatillo starts to break down. If you want a soup with a bit more body, puree all of that together- but if you want a more chicken-and-veggie soup it’s fine to simply let it be. Add the stock and tomatoes to the mix, cover, and bring to a boil. Reduce heat to low, add the carrots and chickpeas, and cook at a simmer until the carrots are cooked through. Add the leafy greens and chicken in the last couple minutes of cooking and turn off heat when the greens are soft. Set aside. 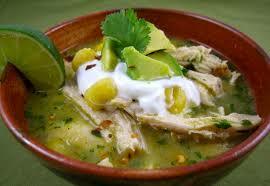 To serve, ladle soup into bowls, garnish with the cheese if using, cilantro, and avocado slices. Serve with lime wedges on the side. Happy Cooking!